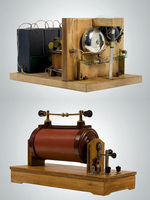 This wireless transmission system consists of a radio transmitter (Ruhmkorff coil) and a receiver with coherer to register electromagnetic oscillations made audible by a sequence of sounds on an electric bell. If the transmitter button is pressed briefly, the receiver replies with a single ring, while if the key is held down, the receiver produces a series of rings. The coherer must be shaken to resensitize it, which happens automatically when the bell hammer taps the bell.